Producers of the smash Broadway musical WAITRESS announced today that Erich Bergen will take over the role of Dr. Pomatter on June 5 and play through August 12. WAITRESS will mark Erich’s Broadway debut. He currently plays Blake Moran on the CBS drama, Madam Secretary, beginning its 5th season this fall. 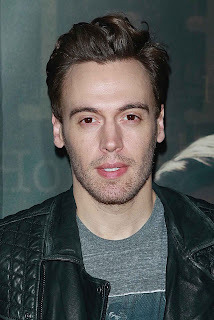 In 2014 he starred as Bob Gaudio in the film Jersey Boys, reprising his performance from the National Tour and Las Vegas productions of the show. WAITRESS recently celebrated its second anniversary on Broadway and is on a National Tour. WAITRESS tells the story of Jenna (Katharine McPhee, through June 17), an expert pie maker in a small town, who dreams of a way out of her loveless marriage. A baking contest in a nearby county and the town’s new doctor may offer her a chance at a new life, while her fellow waitresses offer their own recipes to happiness. But Jenna must find the courage and strength within herself to rebuild her life. This American musical celebrates friendship, motherhood, and the magic of a well-made pie. Based on the 2007 motion picture written by Adrienne Shelly, WAITRESS is the first Broadway musical in history to have four women in the four top creative team spots, with a book by Jessie Nelson, a score by six-time Grammy Award-nominated singer-songwriter Sara Bareilles, choreography by Lorin Latarro and direction by Tony Award-winner Diane Paulus. WAITRESS is produced on Broadway by Barry and Fran Weissler and Norton and Elayne Herrick.